Foodbanks Bad, Welfare State Good? I’ve written a lot – some might say too much – about foodbanks of late. One of the things I’ve been most struck by in reading the commentary and discussion about these sort-of permanent soup kitchens is the sharp distinction drawn between foodbanks and the welfare state. Critics, no doubt rightly, accuse the government of abdicating responsibility for the poorest of the poor; and expecting the charity sector, in the shape of the foodbank, to take up the slack. It is demeaning, they argue, to stand in line for a food parcel. But is it really any less demeaning to stand in a not dissimilar line at the door of a job centre or welfare office. Don’t both turn people into state dependents (or ‘extended state’ dependents if we are to acknowledge the extent to which the voluntary sector is already funded by, and itself dependent upon, the state)? What makes one unspeakably awful and the other okay? As anybody that knows anything about foodbanks will tell you, the rise in their number is largely down to the fact that one (the food parcel) has replaced the other (the benefit payment). Some people who would previously have stood in line to collect the latter are – as a consequence of sanctions, a delay, reduction or change in eligibility to their benefits – instead collecting their charitable parcel instead. While a cash payment is, of course, preferable to a parcel, the associated stigma is surely only a matter of degree and the circumstances that brought one there indistinguishable. It is highly unlikely to have anything to do with a sudden onset of starvation because this isn’t, in most instances, new need. The parcel recipient isn’t, for the most part, any more hungry than they were before, despite what you might have heard. You see, for the critics of foodbanks the state – in this case, the welfare state – is regarded as an entirely benign force for good in people’s lives; and not something from which they should be parted. The demeaning experience of dependency is, they assume, either peculiar to the stigma that comes from using foodbanks; or, in the case of benefits dependency, a myth maintained by nasty right wingers intent on blaming so-called skivers and scroungers for their misfortune. The truth, in fact, is that the reform of the welfare state, far from making savings in this supposed age of austerity, and for all the mock outrage of its critics, is actually a fairly feeble (and largely failed) attempt to make it work a little less badly. Because such is the dependency implicit in the workings of the welfare state – akin to that of the charity sector on the state – that the government estimates that £1.4 billion a year is being paid out to just nearly half of Employment Support Allowance claimants alone on account of their mental health problems. That it is now trying to compel the estimated 260,000 claimants with untreated depression and anxiety to seek treatment in a desperate attempt to shake-off some of its more longstanding dependees is at least understandable. I’m not one to blame dependents for their dependency but neither am I in the business of divesting individuals of responsibility for themselves either. So the problem of welfare dependency is a direct consequence of the interventions of welfarist policies, programmes and professionals into people’s lives; and not – as some of welfare’s critics will have you believe – something that can be blamed on its supposed beneficiaries. Having said that, we shouldn’t be surprised if some live up to those feckless caricatures as a consequence. And both the advocates and critics of welfare tend to be too narrow in their understanding of what dependency is and isn’t. The failure to get to grips with the crippling social and moral problem that is dependency is about more than welfare dependency in this narrow benefits sense. The expansive and therapeutic logic of welfarism is such that not only our welfare but our very ‘wellbeing’ is now deemed the business of the state. According to David Boyle, independent reviewer of public services, people have been turned into clients of the state by welfarism. We, or they, have become a ‘grateful, passive multitude’ to whom things are done by the state, whether it is the benefits system, the NHS or the way social care is ‘delivered’, doing the doing. 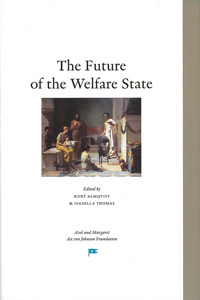 The welfare state, he says, is ‘over-professionalised; dismissive and suspicious of the neighbourhood networks which had underpinned people’s lives for generations; undermining informal advice and support; [and] allowing the ties of mutual support to atrophy.’ For instance, the searching for top-down, state-led, managerial solutions to problems that are to do with relationships between people, and the intangibles of care and compassion in our institutions and our communities is to undermine the ‘informality’ and ‘mutuality’ on which they are built. So the recent announcement that there will be a tougher regime of inspections – and the threat of ‘special measures’ – in our old people’s homes as well as our hospitals to protect older and disabled people from the horrors visited on patients at Mid Staffordshire Hospital and elsewhere, points to this wider problem of dependency. The origins of a number of today’s social problems are in the experience of officious interference in previously informally managed areas of our lives. Whether it’s the smoking ban and so-called healthy living campaigns that affect us all in one way or another; or those communities where a reliance on the state has become so ingrained that the riotous consequences have recently been inflicted by their own offspring – welfare dependency is a problem that itself needs solving. It cannot also be the solution to those self-same problems. This is not to say that dependency in itself is a bad thing. It is who, or rather what, one is dependent on that matters. Indeed we would do better to foster the interdependence of the relationships that make up the informal spheres of family, community and society at large – apart from and independent of the state. Whether it’s the treatment of the elderly, the self-respect of the poor or simply because given the opportunity most of us are pretty robust and self-reliant, and able to make our own decisions about how we live our lives, it is only by the state not stepping in all the time that we have a hope of solving those problems.